Fire at Johnson family ranch in Cranfills Gap, Tx. Photo taken by Meg Edwards. High winds and dry weather combined to fuel grass fires that left thousands of acres of Texas blackened this weekend. Winter frost that has killed grass and lack of rain have left the landscape receptive to burning. No injuries were reported today. A 53-year-old man died yesterday of burns suffered in a morning fire near several homeless camps in a wooded area of southeast Austin. The man, burned over 90 percent of his body, was taken to Brooke Army Medical Center in San Antonio where he died. Last night, crews were summoned to a rural area in Montague County to contain a 1,000-acre blaze that appeared to have started on the side of a road. No structures were threatened and no evacuations were ordered. In Jones County, a fire that torched 2,500 acres beginning Thursday no longer was active and was being monitored locally. Fifteen departments and at least 200 volunteers responded to that blaze, which destroyed, six homes, five hunting cabins, 20 outbuildings and 10 vehicles. 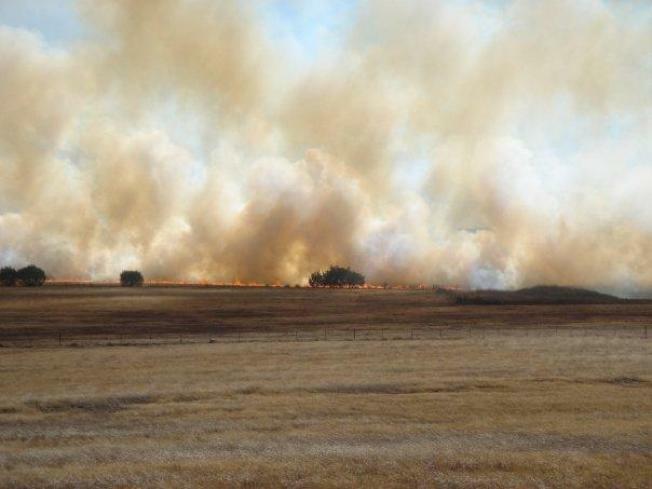 Another blaze near the Shackelford and Throckmorton county line was estimated to have burned more than 1,000 acres, destroyed two outbuildings and threatened six other structures.